I believe that the government is not doing enough to address the fast-spreading Islamophobia epidemic. Since the national tragedies of September 11th, 2001, the United States has seen an increase in hate crimes, suspicion, and prejudice towards Muslim Americans. These discriminatory acts are all unfortunate symptoms of a disease known as Islamophobia, or the severe fear of Muslims. Any mind can be infected by this biased anxiety, but the daily news influx regarding recent Islamic terror attacks and the nervous stances of many politicians perpetuate the disease. For good reason, Americans are frantic to prevent unwarranted mass shootings and terror attacks, but confusing ordinary Muslims with murderous Islamic radicals is a mistake with dangerous repercussions. Since 9/11, the uneasiness that many Americans hold towards Muslims has rapidly developed into hatred. Cases of hijabs being ripped off of the heads of Muslim women and mosques being set on fire have grown more common in modern media, but the anti-Islam volcano has been building up pressure since before these incidents. The United States took some well-intending steps to combat terrorism in our country after September 11th, 2001. We passed the Patriot Act, which allows the government to inspect private files and detain possible extremists, and we opened the Guantanamo Bay detention center, Gitmo, as a prison for violent radicals. However, in our effort to fight terrorism, the United States has become progressively discriminatory towards Muslims. In 2002, the NYPD began secretly investigating mosques and conducting “voluntary interviews” targeted at Arab and Muslim Americans. In addition, Gitmo has become less of a prison for extremists and more of an indefinite holding site for suspected terrorists without trials (“Hope and Despair”). Outside of government institutions, this discrimination has taken the form of hate crimes. Over the past 15 years, America has seen an increase in hate crimes towards Muslims, but no change has been as dramatic as in the past two years. The Center for the Study of Hate & Extremism found that the number of Anti-Islam hate crimes went up by 78.2% from 2014 to 2015, and the Anti-Arab hate crimes rose by 219% (Levin). 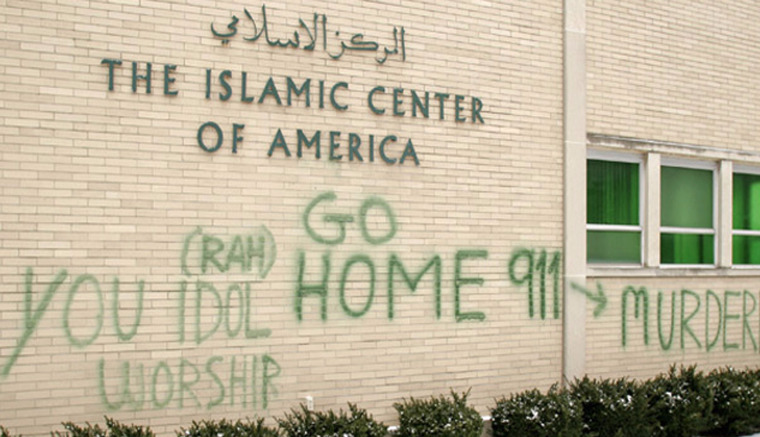 What could be the impetus for such a steep increase in hate crimes towards Muslim Americans? The daily news reports of Islamic extremism and some irrational opinions in the media perpetuate the Islamophobia epidemic. Recently, America has witnessed horrific terrorism, such as the Boston Marathon bombings of 2013, the San Bernardino shooting of 2015, and the recent Orlando Pulse night club massacre. In addition, some political attitudes, including the opinion of current presidential candidate Donald Trump, have begun to focus strictly on ending Islamic extremism and Muslim immigration. Though ending these terror attacks is, of course, an important goal, many of these attitudes are instilling anxiety into the minds of the American people. It seems to many of us that Islamic extremism is a risk to any and all Americans, but this is an irrational fear that must end. We cannot continue to label all Muslims as extremists and discriminate against them as such because not all Muslims are violent radicals. In fact, the majority of terror attacks are committed by non-Muslims. From 1980 to 2005, the FBI found that non-Muslims carried out 94% of terror attacks in the United States, and the EU Terrorism Situation and Trend Report found that less than 2% of over one thousand terror attacks in Europe over the past five years were committed by Muslims. In addition, the Global Terrorism Database reports that there have been at least 150,000 terror attacks since 1970. Even if each of these attacks were committed by an Islamic extremist, which they were not, these Islamic radicals would only account for 0.0094% of the global population of Muslims (Alnatour). Even with this overestimation, the vast majority of Muslims are not terrorists; therefore, we cannot judge all Muslims as extremists. What can we do to cure Islamophobia in our country? This is where you enter the frame, Mr. or Ms. President. It is vital that we change the way Americans view Muslims, and that begins in the media. The incumbent president Obama is currently attempting to remind the public that most Muslims are not extremists. President Barack Obama has claimed that "An attack on one faith is an attack on all our faiths” (Ortiz). We are a nation that guarantees free religion without discrimination, after all. However, I believe that more can be done to fight off our irrational fear of Muslims. As president, you should continue Obama’s work of encouraging Americans not to fear an entire religion of people. When you are president, maintain the security measures to end terrorism that are fair to all: monitor not only Muslims but all potential extremists and continue to review the backgrounds of potential immigrants. However, while upholding national security statutes and fighting terrorism, you should persist that Muslims are by no means the main source of terror in our country. It is important that you take action and implement policies that fight discrimination, hate crimes, and the unjust imprisonment of Muslim Americans. You are not, however, limited to your policies. Work outside of politics to spread awareness of Islamophobia, and ensure Americans that their Muslim neighbors are no more of a threat to them then their Christian or Jewish ones. Above all, it is essential that you maintain an unbiased opinion towards all Americans. I implore you, Future President, to use your power to battle the Islamophobia epidemic while fighting terrorism in our country. “Hope and Despair: Being Muslim in America After 9/11.” NBC News. 11 Sep. 2016, www.nbcnews.com/storyline/9-11-anniversary/hope-despair-being-muslim-america-after-9-11-n645451. Accessed 27 Oct. 2016. Levin, B., & Grisham, K. “Hate Crime in the United States.” Center for the Study of Hate & Extremism. California State University, San Bernardino, 2016, www.documentcloud.org/documents/3110202-SPECIAL-STATUS-REPORT-v5-9-16-16.html. Accessed 27 Oct.
Alnatour, Omar. “Muslims Are Not Terrorists: A Factual Look at Terrorism and Islam.” The World Post. Berggruen Institute, 9 Dec. 2015, www.huffingtonpost.com/omar-alnatour/muslims-are-not-terrorist_b_8718000.html. Accessed 27 Oct. 2016. Ortiz, Erik. “President Obama Asks All Americans to Fight Islamophobia During First Mosque Visit.” NBC News. 3 Feb. 2016, www.nbcnews.com/politics/white-house/president-obama-first-visit-u-s-mosque-call-religious-tolerance-n510296. Accessed 27 Oct. 2016. For all the lovelies in my 2nd hour. The colossal issue of student debt affects America's youth. Abortion, one of the most controversial issues in today's society, is a very important factor, especially for women in this next election. The topic that I feel most strongly about is the treatment of parents of newborn children. Abortion in the US is a growing issue that needs to be addressed. A letter to the future president about racial inequality against people of color.